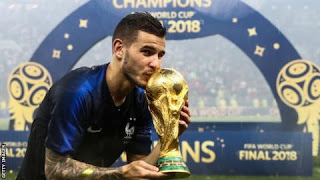 Bayern Munich have signed Atletico Madrid defender Lucas Hernandez on a five-year deal value a club record 80m euros (£68m). The 23-year-old, who won the 2018 World Cup with France, will be part of the Bundesliga leaders on 1 July. During his medical at Bayern, doctors discovered Hernandez had broken a ligament in his right knee and he subsequently had surgery on Wednesday. "Bayern Munich is one of the best clubs in Europe and the world. I'm proud to be able to fight for all possible titles with Bayern." He has won fifteen international caps for France, featuring in all their World Cup games in Russia.